Home Big Scuwop - "Solid" Big Scuwop - "Solid"
Bred in the nation's capital of Washington, D.C., rapper Big Scuwop has been developing his skills since midway through high school after rawing influence from rappers like Shy Glizzy and Future. But while Big Scuwop's sound developed amidst the trap music craze over the mid 2010's, now he's breaking out with his own sound and new single dubbed, "Solid." 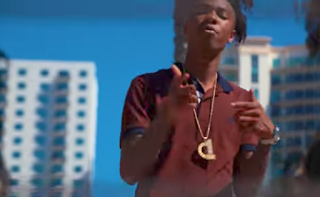 This song has viral hit potential all over it as Scuwop is pictured around Tampa rapping with a cadence and flow perfect for this new generation of listeners. Going forward, Big Scuwop plans to "put on the pressure," saying, "I plan to apply pressure like you never seen before. I feel like i got something to prove, so you can expect to see my face and hear my name a lot these next couple of months." Persuaded to pursue a career in music by friends who were already recording, Big Scuwop broke onto his local music scene with the song, “Sauce On Me,” which was actually the first song that he wrote by himself and recorded solo. From there Big Scuwop is set to debut his project Live From My Conscious, in the Summer of 2017 complementing the project with several music videos. Gearing up for the project, Big Scuwop is releasing his lustful song "Mines Forever." "It was just me talking my stuff in my vibe again, saying how if a chick ever mess with me, she’s stuck with me. It don't matter if it's 10 years later and she got a family, Imma always be able to smash," Big Scuwop said. Remaining humble, Scuwop is grateful to the fans that have been rocking with him as he strives to get better every day. "I appreciate everybody thats rocking with me. It's only gonna get better from here, ain't no looking back. I try to better myself in all aspects of life everyday, so I promise to keep letting y'all hear my progress in every song," he added. Tags : Big Scuwop - "Solid"